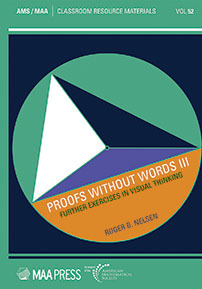 Proofs without words (PWWs) are figures or diagrams that help the reader see why a particular mathematical statement is true, and how one might begin to formally prove it true. PWWs are not new, many date back to classical Greece, ancient China, and medieval Europe and the Middle East. PWWs have been regular features of the MAA journals Mathematics Magazine and The College Mathematics Journal for many years, and the MAA published the collections of PWWs Proofs Without Words: Exercises in Visual Thinking in 1993 and Proofs Without Words II: More Exercises in Visual Thinking in 2000. This book is the third such collection of PWWs. [This book] is a hugely enjoyable read, with intrigue and interest in every diagram.